Three strong working women living under the same roof. A mother and two daughters. All opinionated dazzling, feisty. Any other country and they’d all have apartments apart but that's the beauty of India, they live in the same home and work it magically. They all get the best of belonging to the same world of glamour and celebrity. How does it work? Especially with Lillete and Ira working in the same play that debuted recently. Interestingly that same play- Tracy Letts’ darkly comic drama ‘August: Osage County’ -the key issues dealt with is Mothers and Daughters, who verbally and physically abuse one another rather than exhibit kindness - their tough-love and power-play. Lillete enjoyed the play immensely, where she tapped into her own emotions and explored feelings which “may not always be pleasant or easy ones. You go into places inside you have left behind to essay a role. It is always a tussle for a mother, whether to mould a child or allow them to have their responses. But I realized very early that to give them a value system is the most important thing. After that I’ve allowed them to have free thinking opinions. They are not puppy dogs, so there is bound to be some friction” shares Lillete. 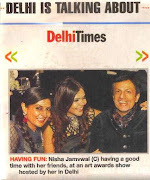 It’s quite obvious that daughters Neha and Ira are strong independent women with strong ideas. But I’ve known them for years and know that they make up their own minds and are definitely not dominated by their mother “For me they are like friends. Sometimes I put on the mummy cap but I realize they are grown up ‘people’ with whom I enjoy communicating, sharing and talking to on a personal and professional level. Yes it is very tempting to tell them how to live their lives. I have to keep pulling myself back. The maternal instinct is strong; I see mistakes happening and know the result. I’ve been there done that. If it’s very serious I don't take the chance, I step on it and tell them. But what a mother has to realize is that the learning has to happen by going through an experience by yourself. Let a child play it out, the learning will be richer and greater lasting. “I remember a funny incident where Neha broke up with her first boyfriend was crying and told me very emphatically to keep out. I was so worried but sat in my room forcing myself to go about my day. After an hour she came storming out “why didn’t you come in.” I was surprised, and told her that it was she who had told me to ‘keep out of it’, to which Neha retorted, “You’re a MOM, you’re supposed to come in and insist and cajole”! Sometimes you lose either way” laughs Lillete. 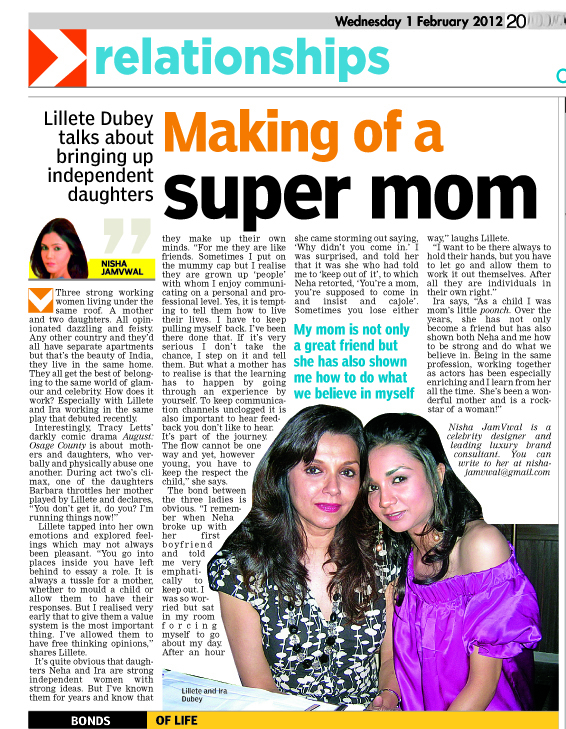 But I’m sure it’s all worthwhile Lillete when your daughter gushes “I love being my mother’s daughter- as a child I was her little poonch and remember being fascinated with her clothes, shoes and jewels as every little girl is... But through the years she has not only become a great friend but has also shown both Neha and me how to be strong, independent women, how to do what we believe in and always retain a sense of grounded-ness and humility. For me being in the same profession, working together as actors, as partners in theatre has been especially enriching and I learn from her all the time. She’s been a wonderful mother and is a rockstar of a woman!” Ira is a well known actor on her own steam, no little thanks to Lillete’s nurture and lack of suggestion! 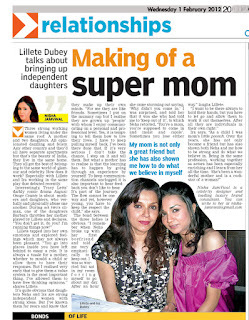 Motherhood is indeed a challenge, and its interesting how you have brought out the different nuances of being a mother through your columns! Nisha JamVwal has aptly said about utilising friendships.From their appearance we can understand who they are real or reel.